When thinking of the term ‘forest house’, most people would imagine a wooden cottage or cabin; a rustic or rural setting that hasn’t been exposed to modern design or contemporary décor. Well, today on homify 360°, we turn the tables on that vision, and introduce one stylish, ultra sleek house. 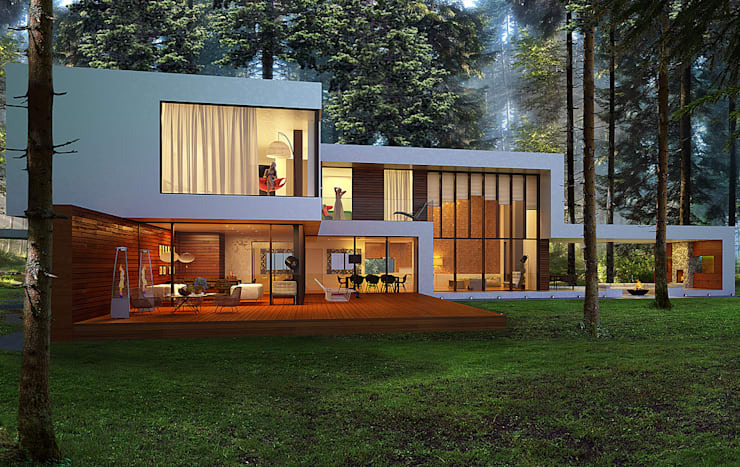 A unique mix between minimalist and modern design, this residence has all the sophistication and charm that one could possibly want in a house in the woods. Upon first glance, it is crystal clear that this abode is one fantastic creation that does not belong in your typical suburb, hence the decision to give it its own lush setting; and the fact that it’s set in such a gorgeous wooden forest just adds to its magical ambience. Big rectangle-shaped volumes intertwine most fabulously with each other, conjuring up open terraces and spacious rooms, all adorned with the finest and most striking materials and patterns. No doubt this open terrace is the favourite location. Anything can happen here: friends can reminisce about the good old days over a bottle of wine; lovers can share quality time in front of a modern fireplace; and children can playfully hop to and from the wooden deck onto the lush landscape that surrounds this majestic setting. Notice the fabulousness that is those gigantic windows, setting up a strong visual link between interior rooms and exterior views, and also ensuring a delicious amount of natural light that seeps indoors. Is there any better space to enjoy stylish construction and natural greenery? They say imitation is the highest form of flattery. Well, the stylish hotspot on the one side of the house (that wooden deck with exterior dining space, seating, and fireplace) has been copied, to some extent, on the other side – only this time, graceful tiles adorn the floor instead of warm timber. 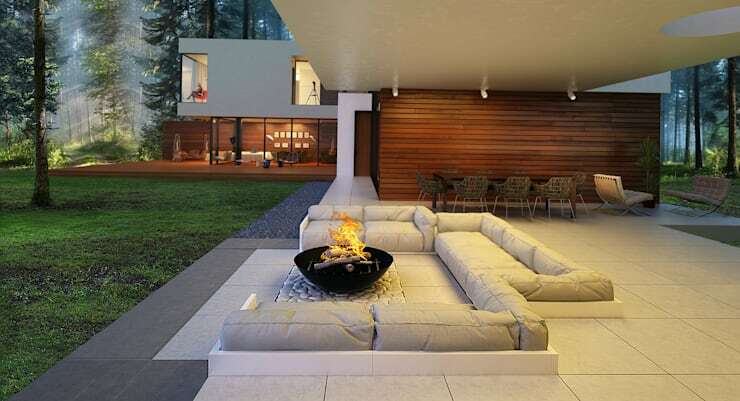 But the rest of the winning elements (chic fireplace and comfortable-yet-glamorous seating) are all accounted for. In contrast with the terrace, this patio space enjoys some cover, in case an unexpected rainfall decides to make an appearance during that al fresco dinner. On the far side of the house we locate the carports, which is spacious enough to house three luxury-sized cars. Those terrific timber panels still continue to adorn the surfaces, and here they form the entire garage area with pristine perfection. In contrast to the house’s front, the back side is rather closed off, ensuring a strong dose of privacy for the family fortunate enough to call this abode ‘home’. Crystal-white concrete and honey-warm timber stand out most strikingly among the lush trees and grass, conjuring up visions of a modern oasis in the middle of a dense forest. One last look at this magical residence, and here we can see how the carport links up with the main house. Climbing vines adorn the wall area leading up to the main entrance, making for a semi-covered pathway on the way to that fantastic house. Want to see more stunning modern houses in perfect locations? Then take a look at: A Modern Yachtsman’s Dream Home. Wow... just wow! But that is only our thoughts on this majestic house. What do you think of it?